We’re your neighbors. We care about you, and that means we always look for ways to protect you better, including carefully choosing the insurance companies we represent to be both affordable and responsive. Why do I need auto insurance? New Brunswick law mandates that anyone wishing to operate a motor vehicle must have insurance coverage before getting on the road. So you may not think it makes a difference if you get it from a talking lizard, a comic spokesperson, or a locally owned insurance provider like Guy R Day. 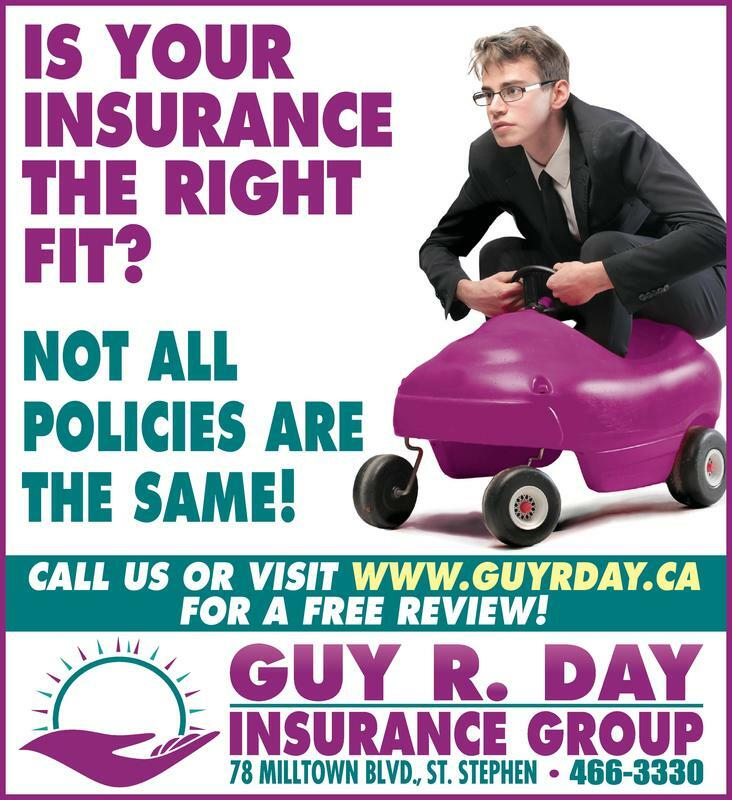 At Guy R Day we’ve seen our share of accidents. But out of all the claims we see on a daily basis, few are as frequent, or as potentially life changing, as accidents involving an automobile. What’s insurance for, anyway? Keep in mind that you can’t buy insurance after you have an accident. Therefore, you should think carefully about the position you want to be in if you should ever be in an accident. Then imagine someone else driving their car right into that shield.Will it hold? What determines my insurance premium? There are many factors that are considered when you’re getting an insurance quote. Some of the more heavily weighted factors are your driving record, where you will be driving the vehicle, your age, your credit rating, and your previous insurance and claims history. Of course, the more coverage you add to the vehicle, the higher the premium will be. For example, a 1996 vehicle with liability only would likely cost less to insure than a new vehicle with full coverage for the same driver. Many believe that the vehicle color or value is a large factor in determining cost of insurance. This is false. Vehicle colour is not a factor, and often doesn’t get reported. When determining costs, insurance companies use the VIN of your vehicle to look at similar models and the experience they’ve had with them. Small, sporty vehicles generally cost more to insure than larger, family oriented vehicles due the nature of how they’re being driven, even though they may cost less to purchase. What if I have a bad driving record? Because it is necessary to have insurance in New Brunswick, you will always be able to buy insurance for your vehicle. Tickets, accidents, cancellations, and insurance coverage gaps may make it more expensive than that of someone with a clean driving record. You’re driving down the road and someone runs through a stop sign and hits your vehicle. You, the driver, and the police agree that the accident was their fault. Traditionally, you would need to call your insurance provider, who would then call the at-fault party’s insurance company, and lengthy and costly negotiations would take place. Under the no-fault system, your car will be fixed by your insurance company, and their car will be fixed by theirs. Your company will fix your car without raising your rates regardless of whether or not you had collision coverage on the vehicle. Because the other driver was at fault, their company will only pay for their repairs if they had collision coverage. If they didn’t have it, they are on their own for the repairs. No-fault insurance is a misleading name. The idea behind it is that it doesn’t matter how it got damaged, the only person responsible for paying to fix your vehicle is you or your insurance company. Fault is still assigned; if you were the guilty one you would see this at-fault accident reflected on your driving record and in your renewal premium. What is liability insurance? Liability insurance protects you from paying damages if you cause an accident. This insurance covers property damage and bodily injury. A couple in Tracy, New Brunswick, have had cars crash into their home 9 times. If you were a driver crashing into that home, your liability insurance would pay for the damage done to their house. If you had also hit a person when you crashed into the house, the insurance would pay for the injuries you caused them. If you caused an accident with a 7 passenger minivan, the injuries of those 7 individuals could easily reach $2,000,000 and above. With such proximity to the United States, it’s important to consider how far that amount would go if the incident took place there. With the current exchange rate, the $2,000,000 coverage has a value less than $1,500,000. Imagine that you hit someone who was crossing the street. This person is now paralyzed and will no longer be able to work as a carpenter. In addition to medical expenses, therapy, and rehabilitation, this person will need to be compensated for the fact that you ended their career. If you only have $500,000 in liability coverage, and these expenses are well over $2,000,000, you would be held responsible to make up the difference. What is accident benefits coverage? Accident benefits coverage will cover your expenses associated with medical or rehabilitation services, funeral expenses, lost income due to disability, and provide benefits to your family in the event of your death. Let’s say your vehicle skids on an icy road and your vehicle rolls into a ditch, breaking both of your legs. This coverage will kick in to pay for your ambulance ride, hospital stay, any surgeries you need, any rehabilitation you need, etc. If you aren’t able to work anymore, the coverage will pay for lost income. If you died in the accident, this coverage would provide a specified amount towards your funeral expenses. If you were the head of the household (the person in the house with the largest annual income), your family will receive money from this coverage to ease the transition to a single income household. What is uninsured automobile coverage? When an accident is caused by an uninsured motorist, the victim is left without remedy for injuries or damages. If you were in an accident caused by an uninsured motorist that left you unable to work and support yourself, this insurance will step in. What is a deductible? A deductible is the amount that the insured agrees to absorb in the event of a claim. If your deductible is $500 on a collision claim, and the claim pays out $12,000 for your vehicle, you will receive $11,500 as they have subtracted your deductible from the settlement. What is collision coverage? Collision coverage covers losses caused by collision with another object or by upset. This generally involves another vehicle, but could also include a tree, guide rail, etc. This insurance covers repairs or replacement of your vehicle in these events. Depending on the age and value of the vehicle, collision insurance may not be needed. Let’s say you have purchased an older vehicle for your newly licensed child valued at $500. A common collision deductible is $500. In this case, it may not be worth it to purchase this coverage. What is comprehensive coverage? Comprehensive coverage covers losses that are not caused by a collision. Broken windshields are very common examples of comprehensive coverage, as are collisions with deer or moose, and theft. What is all perils coverage? All perils coverage is a combination of collision and comprehensive coverage that also covers against theft from someone who lives in your household and hiring someone to drive your vehicle. What is specified perils coverage? Specified perils coverage covers incidents that generally take place when the vehicle is parked. These are things like fire, lightning, theft, windstorm, earthquake, hail, explosion, riot or civil commotion, falling aircraft, and rising water. This is common for unlicensed vehicles kept in storage. What is an endorsement? An endorsement is an agreed upon change to the policy that provides additional coverage, increases limits, decreases deductibles, or removes coverages. What is the loss of use endorsement? The loss of use endorsement, SEF 20, pays for reasonable expenses resulting from a rental vehicle or use of taxis during a claim. Suppose you were in an accident, and the repair shop says it will take 2 weeks to fix the vehicle. You need to commute to work daily, and take your kids to their after-school activities, so you need a vehicle during those 2 weeks. This coverage will pay for a rental car up to a specified amount. We recommend a limit of $1,500. Assuming a rental vehicle costs between $50 and $70 a day, this coverage could cover you for 3 to 4 weeks. This could come in handy if the repairs take longer than expected. What is the legal liability for damage to non-owned automobiles endorsement? The legal liability for damage to non-owned automobiles endorsement, SEF 27, provides coverage for damage to rented vehicles, regardless of the reason you are renting it. Let’s assume you’ve flown to Vancouver to visit family. They live 4 hours from that airport, so you rent a vehicle there to travel around the province. The rental agency will try to sell you a loss damage waiver. If you have this damage endorsement, you don’t need to spend any extra money on this. The rental agency might also offer you liability insurance. Since the car will likely have the least amount of liability coverage they can get away with, having additional insurance will protect you from being responsible for paying what their policy can’t. What is the new car replacement endorsement? The new car replacement endorsement (limited waiver of depreciation endorsement, SEF 43R or 43L) protects you when you have a new car. When you drive a brand new vehicle off of the lot, it loses about 9% of its value. Let’s assume you just bought a $30,000 vehicle. Once you’ve left the lot, that vehicle is worth $27,300. After 1 year, that vehicle has depreciated by another 10%, and is valued at $24,300. After 2 years, it’s depreciated another 12% bringing the value down to $20,700. Without the new car replacement endorsement, the insurance company would limit your replacement to $20,700. The amount of money left on your car loan at this point is probably a lot more than that. The insurance companies know that you don’t want to be making car payments on a vehicle that doesn’t exist anymore, so the $30,000 value of that vehicle will pay off the loan, and get you into something else. What is the family protection plan? The family protection plan is used when the at-fault driver doesn’t have enough insurance to cover your losses.. Let’s assume you, your spouse, and your 4 children are driving home. A driver runs a red light and collides with your vehicle. This driver only has $200,000 in liability insurance. This works out to $33,333 in coverages for each of you. The family protection plan is coverage that is added to your policy to extend the amount of coverage the at-fault driver has. If you are this family of 6, and you have $2,000,000 in liability on your policy, this protection will increase the at-fault driver’s insurance to $2,000,000 as well. You will now be able to receive an additional $1,800,000 towards expenses. $333,333 per injured person in your vehicle can cover a lot more than $33,333. Having this safety net makes sure that your expenses are getting paid now; you’re not waiting years for a lawsuit that the driver may not be able to pay. How much will my rate increase after an accident? There are a few reasons why your insurance premium would increase after an accident. First, you would lose any claims free discounts that you have. Driving and claims history is a major factor when determining your premium. Those have changed because of this claim, so the price changes to reflect that. These increases can be anywhere from 20% to 200% depending on how severe the claim was or how many you’ve had. Generally comprehensive claims won’t affect your rates. What is accident forgiveness? Depending on your eligibility and company offerings, you may be able to purchase accident forgiveness coverage. This will protect your premium from increasing if you have an at-fault accident. I’m going to use my truck to move some furniture this weekend. Am I covered if something is stolen? Personal items stored in a vehicle are not covered by your auto policy. If you have property insurance, like a home or a tenant policy, your personal property is covered there while in transit. My friend wants to borrow my car. Are they covered under my insurance? Any licensed driver can drive an insured vehicle. However, you need to be aware that if they cause an accident, it will be charged to the owner of the vehicle. If your friend hits another vehicle, your policy will pay out the claim, and your claims history will be affected, not theirs. My child just received their drivers permit. Can they drive my car? A class 7(1) driver can drive an insured vehicle with a licensed driver. Any incident caused would be charged to the owner of the insured vehicle. You may think you want the cheapest insurance you can find, but realize you may not be getting everything you bargained for… While most insurance products are similar in price and function, insurance providers are very different when it comes to structuring a policy that actually covers you.